PARADISE VALLEY MILLION DOLLAR HOME. WE SOLD ALL THE ARCHITECTURAL CONTENTS. THE OWNERS OF DISCOUNT TIRE CO. WERE VERY HAPPY WITH OUR SUCCESS. DOMINIC PARDO, TUCSON JEWELRY STORE OWNER FOR 40 YEARS. WE THINK THEY WERE WONDERFUL AND WORKED VERY HARD ALL DAY AND NIGHT. WE ARE VERY PLEASED WITH THE MONEY IT BROUGHT. THEIR VAST KNOWLEDGE OF JEWELRY AND JEWELRY EQUIPMENT MADE THIS SALE VERY SUCCESSFUL. WILL BE HAPPY TO REFER THEM THROUGH MYSELF OR MY WIFE WHO IS A REALTOR WITH JOHN HALL. MANNUELLA TALLEY, WE MOVED OUT OF THE STATE AND TURNED OVER THE KEYS. LEFT THEM WITH AN ENTIRE HOUSE FULL OF MY POSESSIONS. THEY DID AN EXCEPTIONAL JOB AND THE HOUSE WAS SPOTLESS WHEN THEY WERE DONE. WE WERE VERY SURPRISED WITH THE OUTCOME OF THE SALE. RUSS LYON REALTY, BEN FRANKLIN, I ALWAYS CALL THEM FOR I KNOW THEY ARE RELIABLE AND DO A GOOD JOB WHETHER BIG OR SMALL. I've been meaning to write and thank you for the wonderful moving sale you and Brian orchestrated for me. I can't tell you how relieved I was to have someone as capable and reliable as Angels In The Attic come into my home and organize storage items from closets, cupboards, drawers, and boxes in both the house and garage into saleable merchandise. I was amazed at the way you turned a myriad of forgotten objects into displays of attractively tempting articles for purchase. The majority of the major pieces of furniture were gone by the end of the first day of the sale; and by the second day, all but a few small odds and ends had been sold. I have been so glad that we selected Angels In The Attic to conduct the sale because you knew just what price to ask for things and displayed them so beautifully. I would recommend Angels In The Attic to anyone in need of an estate sale or a moving sale. Not only did you lift a dreaded burden from my shoulders (going through and organizing the multitude of stuff I had); but I felt the price you got for the items was fair and much more than I could have gotten trying to sell the things myself. Thanks, again, for the terrific way you handled everything. I appreceate it very much. There are events and happenings in the course of life when it pays to have an Angel in the Attic. I think the four Payne brothers, who lost their parents several years apart, would agree with that statement. Towards the end of January, they used the services of Angels In The Attic Estate Sales. The parents they had the privilege of having for a very, very long time left a big hole in their hearts and lives. They also left behind a big home in the Moon Valley area of Phoenix filled with treasures - some unique, some rare, some just ordinary everyday kinds of things of various ages and values. Some were antiques, some collectibles and some vintage. I write this story as an "insider" to the lives and belongings of Lela and Dale Payne. After living next door for more than 25 years, they were more family to us than neighbors. By choice, we raised our children without TV - so when they occasionally went missing we could be fairly sure they were in Payne's little TV room all setteled in with a snack. On Halloween, the Paynes always had apple juice for the neighborhood kids, and we loved the navel oranges that hung over our fence from their yard. Our three girls were just one, four and seven when we moved into that home. Four years later, we adopted a three month old son. It all happened so fast that summer, when Dale and Lela were away on their boat up in Washington, that when they got back home - a time each year we always looked forward to - they got their first glimpse of our new son. Lela took one look at him and said, "He is part Asian." Very few peole even guessed he was adopted! She detected the baby's quarter percent Korean ancestry by his eyes. How Lela would have enjoyed knowing our son's son, who is just the same age as when she first met his father. Though the Korean genes have been cut in half again, the new baby looks like a clone of his father, Lela would have loved that. When my girls needed any unusual dress up clothes for school projects or events, etc., they would go see Lela. She could have shopped anywhere she wanted, but she was a thrifty soul at heart. Her wardrobe was not the wear-today, gone-tomorrow kind. She kept her clothes for a very long time, so when the day came for strangers to go through her closets looking for treasures, they were delighted to find what is now called Vintage. When our oldest daughter got married, it was in the Payne's backyard. An accomplished musician, Lela played her grand piano for this event. The patio doors were open wide on the day after Christmas, 23 years ago, while about 150 friends and family gathered for the ceremony. The caterers were busy in our yard next door where a sit down meal was to be served. We were lucky to have the sun shining on us that day since December can be cold, even in Arizona. The whole neighborhood still remembers the hot air balloon that took off from the golf course right behind our homes with the bride and groom in it. We shared many of life's events with Dale and Lela...the happy ones and the sad ones. They were like parents, extra special friends, grandparents and neighbors, all rolled into one. Several years ago, when I moved a little ways away, we did not lose track of each other. When Lela's last days were upon her, it gave me much comfort to sit by her bedside. More recently, I would have felt it a privilege to do the same for her wonderful husband, but he was at their cabin in Prescott when the news came of his passing. It was the end of an era and one that left many happy memories. When the day arrived for the estate sale, it was clear that Angels in the Attic had done a great job of organizing and marking everything in the house and outside storage area. I had wanted to be there by the time the doors opened at 8 a.m. on that Thursday. I knew what was in that home. My kids knew what was in that home. How would it feel to see strangers taking it away to their homes or shops, perhaps to sell it to someone else? Having one of our first rainy days did not lift my spirits any, but the sale began before 8 a.m. It would not have been wise to leave a long line of people out in the wet weather, so the practical thing was done and the doors were opened. Since I have a house full of stuff... some treasures, some unique, some rare and mostly just everyday kind of things ... the last thing I needed to do was gather up more. But, I had a strong urge to select just a few little things to remember my dear friends ... things that will have meaning to me until the end of my days. I chose a variety of items at the sale. Some will be of practical use, others are nice mementoes. The almost new muffin tins would be quite useful since mine are at that rusty, crusty stage. I am quite sure Lela never used these almost new tins, but her caregiver probably did. The pretty little porcelain hand painted dish was perfect, and the seekers of vintage items had passed up. I was in the mood for adopting things others would ignore. The stainless steel roaster pan was a great buy at $4 and was something useful that I had been wanting; foil pans for cooking big birds just don't work for me. The little glass water pitcher is of little monetary value, but was adorable and will look great with fresh flowers in it. It has stayed on my counter as a reminder of this day. It didn't look like the books were selling well so I went back on Saturday to see what might be still available. With just a short time left for the sale, everything was marked half off. Three little stainless steel egg cups looked a little forlorn in the now mostly empty kitchen. They would make a true treasure for my daughter who collects egg cups and loved these people who saw her married in their own back yard! The egg cups are now in Walla Walla, WA. My youngest grandson, in Kennewick, WA. now has four children's books with stickers in them labeled Mr. and Mrs. Dale Payne and their address. He will never know who these people were or what they meant to our family, but I feel good about where those books are. My creative granddaughter in Georgia will love the wrap-around vintage appliqueed skirt with rick rack on it. Measured by the emptiness of this home, which was once such a haven to so many and so much, the sale was extremely successful. For those of us who knew and loved the Paynes, a treasured chapter in our lives has been brought to a close. As luck would have it, there is another Angels in the Attic sale in my neighborhood this week. I'm hooked. I don't need a thing, but you just never know...! 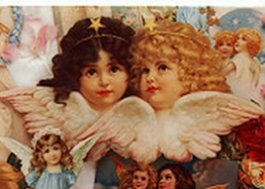 Check out Angels in the Attic's web site often in order to keep track of where you might find your next treasure: www.angelsintheatticestatesales.com or call 602-943-6922. If I were a dealer with a space in a shop or a shop of my own, no doubt I would be out there shopping every chance I had ... after all, I did it without needing a reason--other than reasons of the heart.